An integrated web-based platform, eEnviPer, aims to provide for the application, administration and consultation of environmental permits, thereby making the environmental permitting process more transparent, more accessible and more efficient. The platform will be available in early 2014 after intensive field tests in five European countries (Croatia, Greece, Italy, Serbia and Turkey). eEnviPer uses innovative technical approaches such as public sector cloud services and service-oriented architecture (SOA) to build open, flexible and collaborative eGovernment services while at the same time lowering information and communication technology (ICT) costs. The use of an internet-enabled platform can be a first step for municipalities and authorities to make their permitting processes more cost effective, transparent and user-friendly. The system offers the possibility for public administrations to easily deploy both new services and existing procedures as shared services. The platform can also access locally available data sources such as geospatial information through industry-standard XML-based interfaces. This paper examines the cloud computing aspects of the eEnviPer platform in detail. The first section introduces cloud computing, cloud based services and deployment models. The second section analyses the transition and the benefits of government services into cloud implementation. Finally, the last section focuses on features of the eEnviPer platform as a cloud based service. Cloud computing is a hosting service that enables users to use hardware and software resources remotely over a network connection without investing in processing power, software or hardware themselves. Cloud service providers therefore allow organizations to meet their information technology requirements (such as hardware capacities, software and file storage needs) without the cost of the initial investment. Instead, customers usually sign up for a flexible rental or fee-based payment contract. With such a rental model, one also has the advantage of continuous service delivery and maintenance without paying extra fees for upgrades or troubleshooting. In the face of changing business needs, cloud computing provides a flexible structure and adaptive capacity for information technologies. allowing consumers to flexibly expand or shrink their resources based on their changing business requirements and monitor these resources to control and optimise the usage. Software as a Service (SaaS): to use an application without controlling the operating system, hardware or network infrastructure on which the application is running. Consumers are only allowed to use the software provided on the cloud architecture, without any need for managing the hardware and the platform resources. Consumers can access the SaaS applications via several clients including thin clients, browsers and mobile hand-held devices. 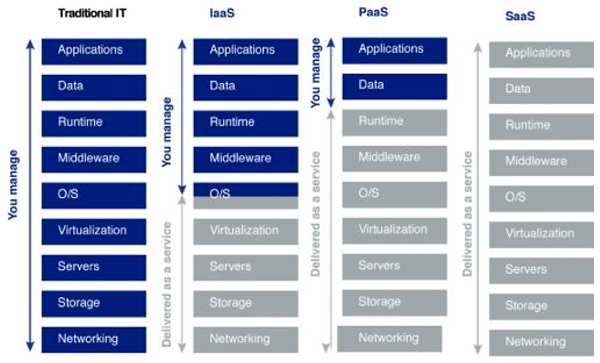 Platform as a Service (PaaS): to use a hosting environment for the applications without controlling the operating system, hardware or infrastructure on which the application is running. Consumers are allowed to deploy their own applications on PaaS platforms created using databases, application development languages, services, libraries and tools that are supported by the cloud provider. Consumers are not allowed to manage the network, hardware and operating system components in this model. Infrastructure as a Service (IaaS): to use computing resources on a virtual machine, such as processing power, storage and network without controlling the cloud infrastructure. Consumers are allowed to provision processing, storage, network resources to run their own platform and/or software on the cloud environment. The consumer is not allowed to manage the cloud platform itself but has a maximum flexibility to control the resources in the cloud platform. Each service model includes different services, from data and applications to storage and networking. Today, egovernment services are slowly moving from traditional IT via other cloud service models to SaaS solutions. private cloud: the cloud infrastructure is operated solely for a single organization, may be managed by a third party or by the hosting organization itself; today, most e-government services are deployed on private clouds. Hybrid cloud: the cloud infrastructure combines two or more private, public or community clouds that remain unique entities, but enables data and application portability such as load balancing between clouds. Thanks to these characteristics, cloud computing platforms deploying e-government services are an affordable and flexible solution to the huge ICT infrastructure costs in the deployment, upgrading and maintenance of e-government services. 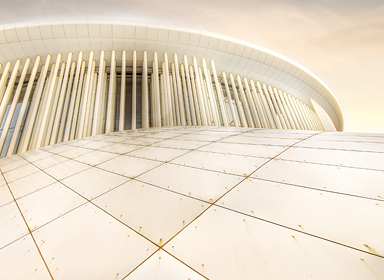 The public sector has an important role to play in shaping the cloud computing market. As the EU’s largest buyer of IT services, it can set stringent requirements for features, performance, security, interoperability, data portability and compliance with technical requirements. The European Commission underlines the importance of cloud computing in the report “Unleashing the Potential of Cloud Computing in Europe”6. The report identifies the Promotion of Common Public Sector Leadership through a European Cloud Partnership as one of three key actions to be taken in the cloud strategy; it states that pooling public requirements could bring higher efficiency and that common sectoral requirements (e.g., eHealth, social care, assisted living, and eGovernment services such as open data) would reduce costs and enable interoperability. In general, the major benefits of cloud computing for e-government services are considered to be: cost effectiveness – reducing capital expenditure, on-demand self-service, scalability, quality of service, ease of implementation and implementation speed, innovation, device and location independency, green savings, reliability and business continuity, as well as efficiency and security. These benefits are of major interest for the public sector. This is evident from the various strategies that have already been adopted by governments in Europe and beyond, including the Cloud First Strategy (US), G-Cloud (UK), Andromede (FR) and Trusted Cloud (DE)7. In all these cases, the incentives cited are more efficient data center utilization as well as re-use of applications to standardize and keep costs lower. For example, the UK quotes estimates of IT standard infrastructure utilization of less than 10%8. Most government organizations spend a significant portion of their technology budgets on procuring and maintaining IT infrastructure, platforms and applications. Purchasing hardware, upgrading software and hiring administrators is a major undertaking, often consuming significant resources. Public authorities can deploy cloud-based solutions such as eEnviPer easily without any need to configure hardware and other software resources. Therefore, the most immediate saving of introducing a cloud based model would be in terms of lower IT costs by reducing or even eliminating capital and operating expenditure and increasing hardware utiliztion rates, by paying only for the services they use and, potentially, by reducing or redeploying their IT staff. From the sustainability perspective, cloud computing offers more flexibility (often called “elasticity”) in matching IT resources to business functions than earlier computing methods, and provides access to the platform from a wide range of locations and/or clients. Resources and services can be rapidly and elastically provisioned to quickly scale-up and rapidly released to quickly scale-down, for example as organizations grow or their business requirements change. From the performance perspective, user will be able to access more top-end IT capabilities – such as higher-caliber hardware, software and IT staff – than they can attract and/or afford themselves. To the e-government service provider, the resources and services available in a cloud platform often appear to be unlimited and can be purchased in any quantity at any time. As the ability to run data centers and to develop and manage software applications is rarely a core competence of public organizations, cloud computing can make it much easier to reduce or shed these functions, allowing organizations to concentrate on critical issues such as the development of policy and the delivery of public services. Besides the numerous advantages of cloud computing, there are still significant concerns about e-government services. Data security, reliability, privacy and legal issues were rated as the top concerns for cloud based solutions investments. Other concerns include are lack of control, lack of standards, lack of transparency, lack of skills, availability of experienced vendors, portability and interoperability issues. Generally, there is no one-size-fits-all cloud solution that removes all concerns of government managers. 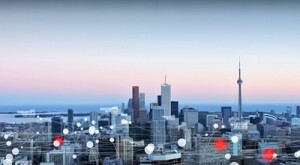 Managers will need to balance their need for a competitive advantage and faster turnaround for their organizations with the wish for a comprehensive cloud strategy in place that makes sense for their unique needs and citizens. While IT managers will want to maintain the relevancy of IT within the larger organization, they also need to manage the rate of growth of their IT infrastructure, the costs of managing it, low resource utilization and the necessary flexibility to meet the rapidly changing needs and outreach required of the agency or department. Cloud computing can be a solution for these concerns, but it needs to be carefully considered and introduced in line with the organization’s needs. The eEnviPer platform is offered as a cloud SaaS solution, i.e., delivered over the internet and accessible through a secure connection with a web browser. It is a Service-Oriented Architecture (SOA)13 based cloud computing platform based on DOTFRAMEWORK. This platform is based on open source technologies such as PHP, Smarty, jQuery and Ext JS, in order to create a solid and reliable operation platform that would be scalable to fit eEnviPer needs. knowledge management systems (KMS) that empower environmental engineers during the elaboration of environmental impact studies. Furthermore, eEnviPer’s SOA-based cloud platform provides access to eEnviPer data through REST-ful services and makes it available for use by authenticated external systems. With this feature, SOAP Web Services and REST-ful application programming interfaces (APIs) can be easily configured and made available for almost any part of the data storage layer. The eEnviPer platform also provides a geographic decision support system for public authorities: DOT WebGIS, a simple online GIS interface to provide geographic information about land use in a certain region. This could include protected areas, existing environmental permits, infrastructure and geographic features. This GIS module presents geographical data on a map and provides users with a comprehensive tool to interact with. The eEnviPer platform integrates GIS layers or existing systems that support environment-related permit procedures and provide digital services for permitting authorities at different levels, enterprises, consulting services and civil society. It has been designed to be compatible with SDI and INSPIRE and the eEnviPer framework has been designed to support the OGC standards (WMS, WFS, WCS, KML). As an example, the eEnviPer platform GIS component might access a data source containing all Natura 2000 areas in Europe using cloud services. In the pilot phase, the eEnviPer platform operates from a server provided by DRAXIS Environmental Technologies in Greece. This server provides centrally the user interface and computation. Ultimately, eEnviPer can be installed on any server fulfilling the system requirements. Where commercial hosts are not an option for security and confidentiality reasons, clients could decide to host a central eEnviPer cloud platform for all municipalities. The use of an internet-enabled platform such as eEnviPer can be a first step for municipalities and permitting authorities to make their permitting processes more transparent and user-friendly. eEnviPer takes the ongoing standardization of the environmental permit workflow and of permit–related data into account to provide more efficient and more sustainable e-government processes.